See details on all our options below! Note: New Jet Black, Blueprint/Blackboard, and Airfield Map Art are created through option #3. Loadout changes (external pods, missiles, antennas, etc…) to an existing art air-frame design can be obtained through option #2. We can substitute the standard 20×30 canvas wrap (a $128.00 value) that comes with the modified packages for any size print of equal or grater value and will adjust the coupon voucher code for the difference (Just let us know in your order notes and leave coupon balance until art is complete). – See more on our print size and price options HERE. 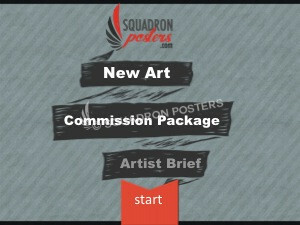 *Commission Art Package Coupon voucher codes are redeemable on “printed” art at retail prices only. Select one of the four options below! We do not charge any design or set-up fees as you will receive the full value back in printed art! – It’s our way of giving back to those who serve our great nation! Time to see first draftWe call this turnaround time, this changes based on how many projects we have currently open. How to tell the artist what you want:To the right are the powerpoint templates our artists will use to make your design! 20x30 Canvas Wrap and $250 Gift CardWhen you approve the art modifications we'll ship it to you on a 20x30 canvas wrap. These sell for $138 on our site, so the design work is free! Immediately upon checkout you'll receive the $50 gift card that you can use on any of our products. If you need to swap out an aircraft on an existing artwork you must purchase Modify Package #2. 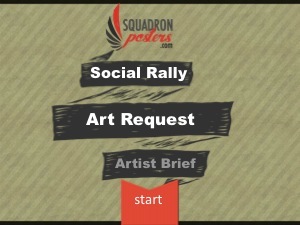 If you want to create a fresh, original design you must use option #3 or the social rally. 20x30 Canvas Wrap and $350 Gift CardWhen you approve the art modifications we'll ship it to you on a 20x30 canvas wrap. These sell for $138 on our site, plus you're getting a $150 gift card, so the design work is free! Yes! If you see a poster background you like but wish it had a different aircraft, ship or vehicle...this is the option for you! $750 Gift CardYou're essentially buying a gift card and in return we'll do the work for free! That's how simple it is. Good for everything on the site, except more art packages. You're creating artwork from scratch with this option so you'll be able to choose whatever text you want! You're creating original artwork so we'll create whatever you need! Yes! We'll work with you until you're happy and create your design from scratch. NoneSocial Rallys don't cost any money up front so there isn't a gift card. Yes! You can submit your design idea but it will be up to an artist's interpretation for the final print. 1-3 monthsBecause there is no commitment to buy anything from our site you're leaving it up to the artist's interpretation. We will solicit your input prior to creating the design but to change it you must use modification packages. We will fix any technical inaccuracies if we missed them from your original request. Because there is no commitment to buy anything from our site you're leaving it up to the artist's interpretation. We will solicit your input prior to creating the design but to change it you must use modification packages. We will fix any technical inaccuracies if we missed them from your original request. Email this to us once you reach 40 votes and we'll start your art when we have an open artist!